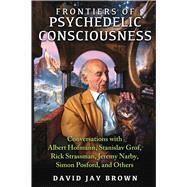 Demonstrating deep knowledge of his interviewees’ work, Brown elicits profound reflections from them as well as their considered opinions on the future of psychedelic drug medical research, God and the afterlife, LSD and mysticism, DMT research and non-human entity contact, problem-solving and psychedelics, ayahuasca and DNA, psilocybin and the religious experience, MDMA and PTSD, releasing the fear of death, the tryptamine dimension, the therapeutic potential of salvia, and the intersections between psychedelics and creativity, ecology, paranormal phenomena, and alternate realities. David Jay Brown holds a master’s degree in psychobiology from New York University. A former neuroscience researcher at the University of Southern California, he has written for Wired, Discover, and Scientific American, and his news stories have appeared on the Huffington Post and CBS News. He is the author of more than a dozen books, including The New Science of Psychedelics. He lives in Ben Lomond, California.